Polar/Solar is lightweight and stays flexible to -67 degrees F. Its rugged T"Prene" insulation provides superior resistance to abrasion, ozone, oil, grease, and chemicals. Plus, the outer jacket is flame retardant and water resistant. 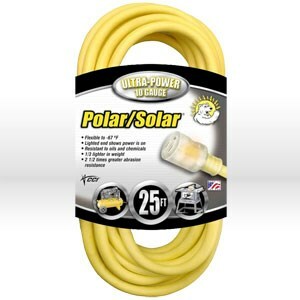 Polar/Solar Extension Cords feature a power indicator light in the female receptacle to show that the power is on.